It may easily be imagined that the profession of a con­tortionist requires an early start and a long apprenticeship. Yet there are certain contortionists in whom the gift has suddenly revealed itself in later life. Boyston, of whose extraordi­nary exploits the pictures accompanying this article give such a striking and startling idea, started life as a tailor. These pictures give such a vivid impression of Boyston's feats that further description of them is unnecessary. He may be called one of the kings of his profession. But without attaining quite such marvelous results, there are many methods by which a contortionist can produce a sensation. One startling exploit which sent a thrill through the whole audience happened a few weeks ago at a theatre in Berlin. A gentleman in a dinner jacket and a tall hat ap­peared upon the stage. He was walking backwards, but never­theless his head was facing the audience and looking at them. When he had almost reached the footlights the gentleman, without moving his head, slowly turned his back into its natural position. Then he saluted the spectators and retired. It is impossible to imagine what a strange impression this, phe­nomenon produced. The acrobats of the music-halls have no end in view except to cause amusement. But suppose one should meet them in ordinary life! Mr. Berkeley, the pro­prietor of a London hotel, was in his office about six o'clock one evening when he heard a knock at his door, while a voice, which seemed to express pain, cried "Open!" Mr. Berkeley obeyed, but a cry of horror escaped him. and he almost fell backwards. He saw before him, rolling on the ground, topsy-turvy, a kind of human ball, which was walking upon its hands, with the head twisted round, eyes protruding, and neck contorted. 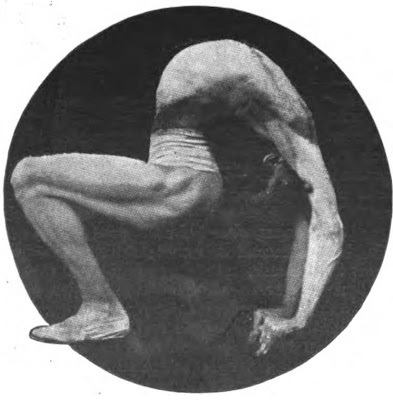 "I did not wish to alarm my neighbors," gasped this extraordinary being — it was a contortionist from a circus, who had been practicing in his room —" but I cannot unhook my leg from behind my neck, and unless you can help me I am afraid it is all up with me." Mr. Berkeley disentangled the acrobat, who fell exhausted on a chair. He had descended twenty stairs upon his hands in this position! Among many Oriental nations contor­tionism forms a part of their religious professions, especially among the Indian yogas and fakirs. Bava Luchman Dass is a Brahmin of the first class, as is attested by the red patch which marks his forehead. For fourteen years he received from the priests of the Black Caves of Central India the necessary education in order to become a yoga, as a yoga must be capable of taking the forty-eight postures of the Hindu idols. Bava was soon the most extraordinary and the most skillful of contor­tionists. At Benares he was seen by a rich English merchant of Bombay, who advised him to exhibit himself in Europe. It is impossible, for want of space, to describe Bava's extraordinary performances, but perhaps his greatest trick consists in balancing himself on the ends of his fingers while the whole of his body is in the air. Bava seemed very surprised at the startling success of this exhibition, as, he states, in order to obtain the rank of yoga in the Black Caves of India he had to continue in this position on the ends of his fingers, under the eyes of the judges, without a second's interval, for seven days and nights! in the case of Marinelli. 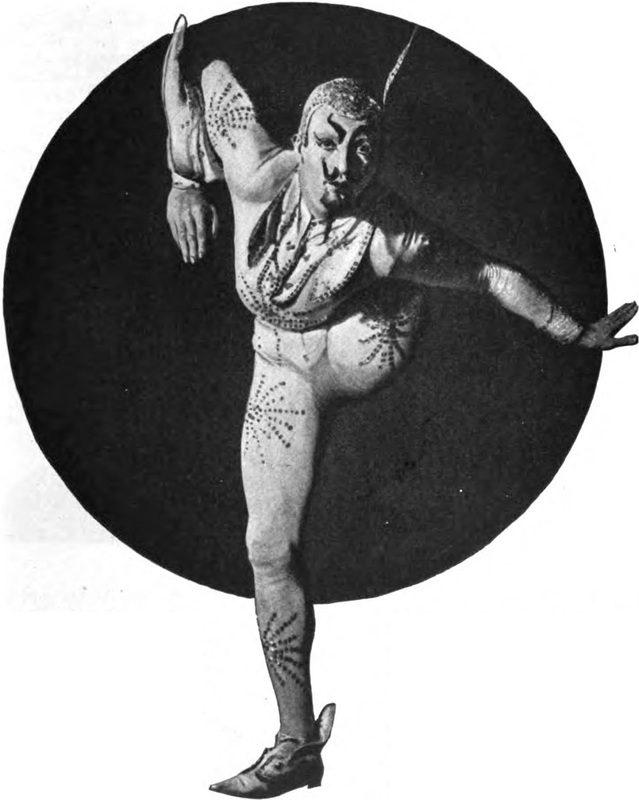 It is a surprising fact in this particularly difficult branch of the acrobatic art are numbered many women. As may be seen by our pictures, the wife of Mr. Boyston is hardly a less successful contor­tionist than him­self. Another famous lady acrobat was Kate Weber, a German girl, with whom is connected a romantic story. One evening at the circus she had the misfortune to fall from her trapeze. At the same moment a spectator sprang on to the stage, lifted the young girl in his arms, and carried her into the wings, where he remained until the doctor assured him she was out of danger. For a fort­night he re-appeared no more, but every morning a messenger left an enormous bunch of roses at the lady's house. Finally the handbills announced the re­turn of Kate Weber, and that very night the stranger was in the theatre again, seated in the same stall as before. On recognizing him, Kate was so agitated that she broke down in her performance and retired in great distress. But the wings the stranger rejoined her. "Excuse me," he said, "I am so faint-hearted that but for the accident of the other day I should never have de­clared my feelings. I love you, and I ask you to be my wife. Will you take me?" Kate Weber accepted him. This timid stranger proved to be a very wealthy man, and the lady acrobat, at the cost of a bad shaking, thus won the happiness of her life.